Artichoke season is upon us. I can’t help but pick them up these beauties from the farmer’s market. Partially because they still remain a mystery to me. What’s one to do with that exoskeleton of tough scales? I know, I’ll watercolor it! I must admit, I am still mastering the art of artichoke carving and preparation. But they will get my asparagus treatment, splitting them in half and baking them with a welcome smattering of garlic, lemon zest, parmesan and breadcrumbs. I need your help, dear readers. 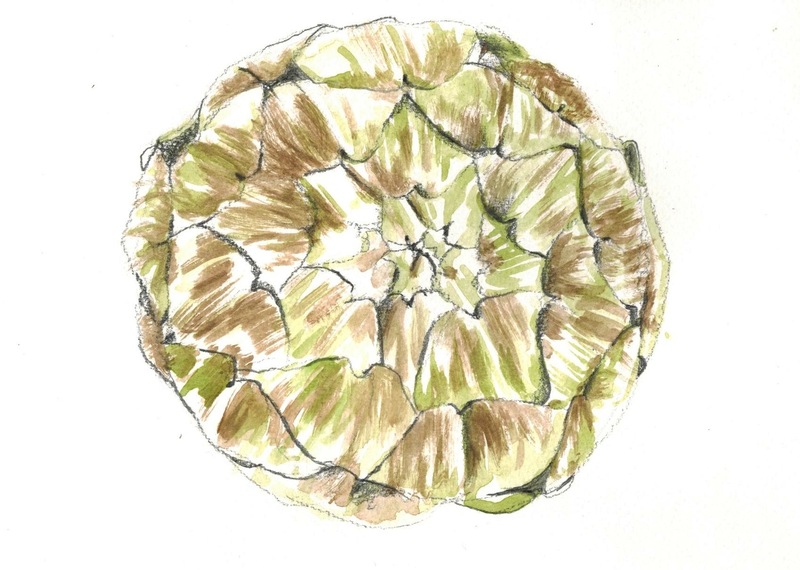 Please send me your favorite artichoke recipes! France is known for many delicious things. There’s charcuterie with all its nuance and varying levels of porkiness. Then there is the abundance of cheese. Charles de Gaulle himself so famously exclaimed, “how can anyone govern a nation that has two hundred and forty-six different kinds of cheese?” Additionally, there is butter. It is the undisputed backbone of traditional French cuisine. It is butter that gives a croissant its flaky altitude of layers. And then there is the butter of the unknown, that special ingredient that creates sensuous sauces and envelopes vegetables on a restaurant plate. However, there is a new realm of butter that I have never known before. One recent morning, I whipped up a tartine for my husband comme d’habitude. I sliced a day-old baguette lengthwise, threw it in the toaster oven, threw a little butter on top, and let the oven do the work. I spread on a thin layer of plum jam and awaited my ‘merci’. “I don’t like it when the butter is melted”, he said. My jaw dropped. It’s toasted bread! The butter is supposed to be melted by the heat of the toast! That’s magic of breakfast right there. I shrugged it off; so particular, this husband of mine. Then over our Alpine vacation, over one of the many chats about food over coffee with my mother-in-law, she exclaimed the same disfavor for the taste of melted butter, like in pound cake. But butter is as butter does, non? I’m an intelligent person. I saw The Tree of Life. And I liked it. But somehow, I never thought about the difference between butter in its many mediums. Alas, at the end of the day, I have lot of work to do. And I am still as American as I Can’t Believe It’s Not Butter!® – Spray.